Well, it is that again. NaBloPoMo! Remember that time last year, when I was obligated to write daily, which induced heart-pounding and hair-ripping stress, and also killed my social life for the entire month of November. Well, I’m doing that again!!! 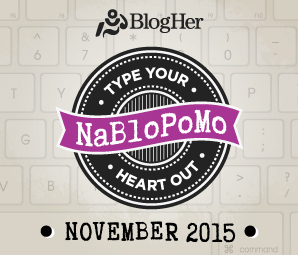 NaBloPoMo is the blogging equivalent of NaNoWriMo, which is much harder and I never plan on doing for the time I am sticking to this planet. This one is where you make a blood pact to write a blog post daily and get stuff up. It could be one word, it could be a thousand, no boundaries are set during this month. So, I will leap fences, swallow trucks, kiss babies, and a bunch of other words like that describe metaphorically what I will be doing this month. Check back and see daily. OK DO IT NOW CHECK BACK TOMORROW BYE!!! !